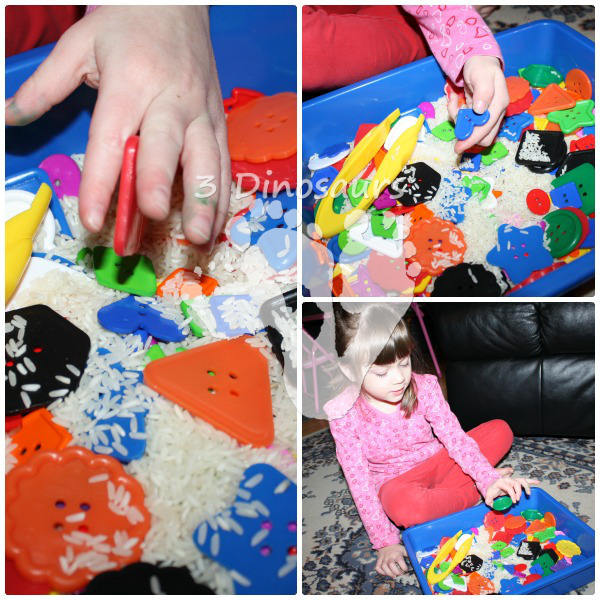 With my youngest love of buttons and rice, I thought it would be fun to do some a shape sensory bin. This was also a sensory bin about learning sizes and colors. There were two different sizes of buttons in the bin. Sensory bin should be about how they want to play and explore the bin. It should not be about what we want to do to explore the bin. 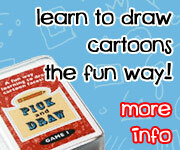 They are a sensory experience not a set planned learning time. I do every now and then add something for them to do outside of the bin, if I think she would like it. 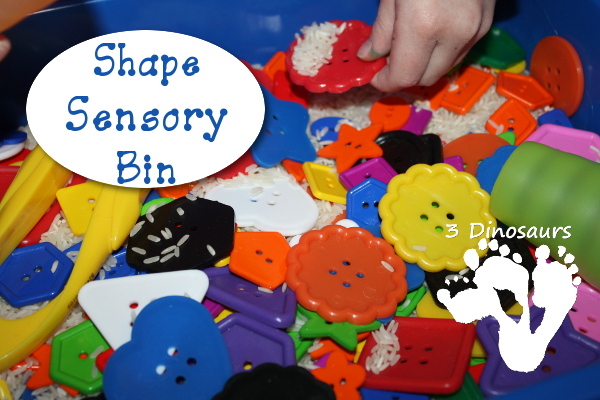 What you need for this sensory bin: small shape buttons , big shape buttons , cups, rice, bin and tweezers . One of the first things Mary did was see what button could scoop up the most rice. She then worked out putting rice into the cup using the button. She did it until the cup was full. She then dumped the rice out and started over doing the same activity. She also did a lot of pouring from one cup to another cup. It is the reason I put two cups in the bin. After she played a while she then started to tell me some of the shapes that were in the bin. Then she looked at what buttons would fit in the cups. 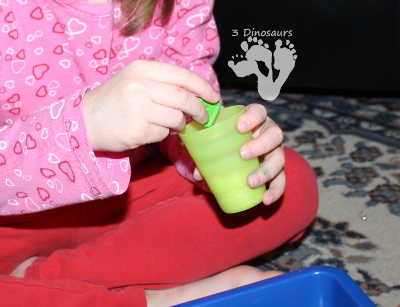 She found that the big ones would not fit and filled the cup with small buttons. 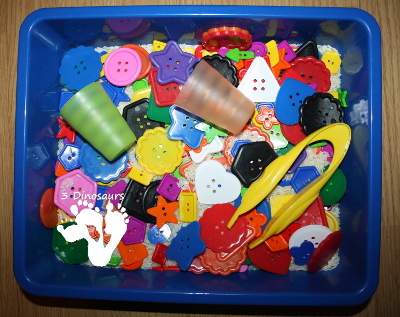 The last activity we did was to sort the buttons by small and big. 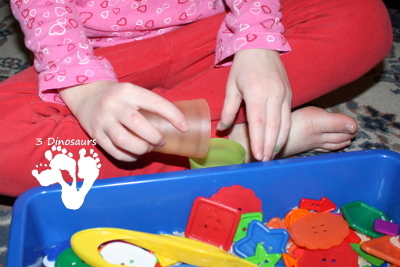 She would either use her hand or the cup and scoop up buttons and then sort them on the paper. I did have a sheet with colors on it, but she decided she was done and did not want to do it. Later I did find her with the sheet doing the activity, but did not have my camera. She loves to play with the buttons. 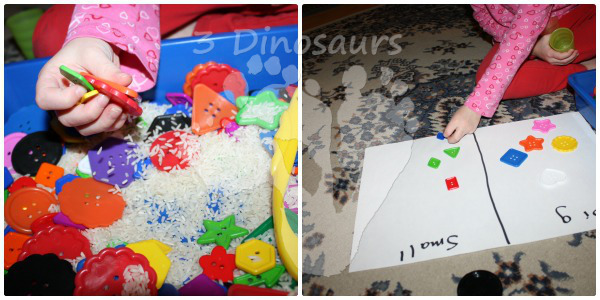 This entry was posted in sensory bin, shapes and tagged color, sensory bin, shapes. Bookmark the permalink. Love the colorful buttons! Pinned!